The U.S. Geological Survey has recorded three earthquakes in Arkansas near the small town of Greenbrier, north of Little Rock. A preliminary 4.7 magnitude quake was recorded at 11 p.m. Sunday night, and according to the AP, was felt in four other states. A 3.8 quake followed just 18 minutes later, with a third 3.6 magnitude earthquake recorded at 2:46 a.m. Monday morning. No damage or serious injuries have been reported. Although the 4.7 quake is stronger than anything felt in the region recently, the latest quakes only compound on a series of mysterious tremors that have been plaguing Central Arkansas since 2009 with unusual frequency. The AP reports that more than 700 quakes have occurred in the area over the past 6 months. The Arkansas Geological Survey has classified the prior phenomena as part of what is now called the Guy earthquake swarm. Scott Ausbrooks, geohazards supervisor for the Arkansas Geological Survey, told the AP that geologists believe the seismic activity is either a naturally occurring swarm, or could be related to natural gas exploration in the region. According to Ausbrooks, geologists don't believe production wells are the problem, but haven't ruled out injection wells that dispose of "fracking" wastewater as a culprit. The earthquakes have been occurring near several injection wells. As my co-anchor, Steve Stadelman, pointed out this morning it sure does feel like we've broken a record for snowfall this month. Even though this month hasn't been a 'record-breaking' month, February of 1994 still holds that record, we do come in as the fifth snowiest. Snowfall this weekend and early this morning has bumped our monthly total to 20.2", just ten inches shy of the record. Seasonal snowfall, however, will go down in the records books as 50.2" has fallen making it the fourth consecutive seasonal snowfall of 50" or more in the history of Rockford! Pretty impressive if you ask me! Severe weather season is quickly approaching, it's already begun for some in the south, and it's time to start thinking about how you can keep your family safe this spring and summer. Severe Weather Preparedness Week runs February 27th - March 5th and it's important for you to plan ahead and know what to do in the event severe weather strikes. For more information go to the Illinois Emergency Management Agency's website: www.state.il.us/iema/. Another sign spring is right around the corner, spotter training classes. Classes have been ongoing for the past couple of weeks and there are a few more in the upcoming weeks. Spotters are a very valuable tool not only for the National Weather Service, but also for us at WTVO. You are our eyes to what is going on in the community and the information you relay to us we can then report to the NWS. Freezing drizzle/sleet/freezing rain and snow fell across parts of the Stateline late last night but has now quickly moved off to the east. There will be a few slick spots this morning, especially on some of the untreated roads where a thin glaze of ice will be likely. You'll need your scrapers and a little elbow grease if you parked your car outside; sidewalks, parking lots and driveways will also be slick. High pressure will move in later this afternoon which will erode our clouds away and calm our winds. Temperatures will remain on the cool side with highs in the low 30s. Severe weather continues to threaten the east and southeast today as a very powerful storm system races off to the northeast. Another moderate risk has been highlighted for parts of Tennessee, far northern Alabama and northern Georgia. Low pressure organizing over the southern plains will move to western Kentucky by 6 am on Monday morning. A warm front lies across central Illinois this evening, and there is very warm, moist unstable air to the south of the front. A strong low level jet from the south is expected to over run the warm front tonight setting the stage for a wild night weatherwise. Preciptiation has already begun (as of 7 pm) in the Stateline in the form of freezing drizzle. As the flow increases from the southwest the freezing drizzle will likely increase in intensity and become freezing rain for a time. There will be enough instability for thunderstorms to get going later this evening with the potential for locally heavy rainfall in the 0.75" to 1.00" range ovenight. As the colder air comes in later tonight the freezing rain will mix with sleet and snow, and become all wet snow after midnight. Accumulations of snow and sleet are anticipated to be in the 2" to 4" range by 5 am on Monday morning. So, with the weather conditions that are expected overnight, a WINTER WEATHER ADVISORY has been issued for Winnebago, Boone, Ogle, Lee, and DeKalb counties from 9 pm tonight until 6 am on Monday morning. This storm system is a fast mover, so all of the precipitation should be done by 6 am on Monday morning. With drier air coming in behind the departing storm system skies will be partly cloudy by 8 am, and mostly sunny in the afternoon. Temperaures will be a little on the cool side for this time of year with a high only around 30 degrees along with a northerly wind at 10 to 15 mph. With clear skies on Monday night the temperature will drop to the middle to upper teens. The cool high pressure will move quickly to the east Monday night and winds will shift to the south on Tuesday, and with mostly sunny skies the afternoon high will top out near 40 degrees. Tuesday is my pick for the best day of the coming week, weatherwise. The National Weather Service has issued a FREEZING RAIN ADVISORY for Winnebago, Boone, Ogle, Lee, and Dekalb counties until 5 am on Sunday morning. There is a boundary across Illinois tonight with warmer air to the south riding up and over the cold air at the surface. Light precipitation has developed on a widespread basis across all of northern Illinois from the Mississippi River eastward to Lake Michigan. Because of temperatures above freezing aloft, the drizzle is coating surface features with a thin layer of ice. Exercise due caution if you are driving tonight through the early daylight hours on Sunday. On Sunday a stationary front will hang in place from northwestern Indiana across central Illinois through northeastern Kansas as low pressure moves out of the Rockies into Kansas. The temperatures will warm enough by Sunday afternoon that any precipitation that falls will be in the form of rain. It appears at this time as if the heaviest rain will pass well south of the Stateline. Rain will continue through the evening hours, and then switch over to sleet, freezing rain, and snow by midnight, and all wet snow later on Sunday night. Some light snow may linger into early Monday morning. By Monday afternoon drier air will move in from the plains, and skies will become partly cloudy. High pressure will move across the area on Tuesday leaving skies mostly sunny, and with a southwesterly wind developing, temperatures will top out close to 40 degrees. The next push of Canadian air will be with the passage of a cold front early Tuesday night. Wednesday will be colder, but not drastically so, with the center of the Canadian high pressure passing eastward north of the Great Lakes to southwestern Quebec by 6 am on Thursday morning. That sets the stage for the next weather system moving eastward across the plains. Skies will become mostly cloudy on Thursday, and there could be a light rain/light snow mix across the Stateline on Thursday night that will last through Friday. Next Saturday looks partly cloudy and a little colder with a high in the low 30's with high pressure from Canada taking control of area weather once again. Drive Safely! 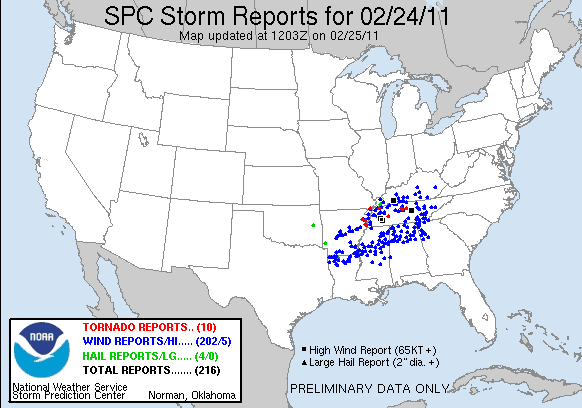 Over 210 severe weather reports came in with the storm that passed to our south Thursday afternoon making this our first severe weather outbreak of 2011. Almost all were wind damage reports, with 10 tornado and 4 hail reports. Heavy rain, damaging winds and tornadoes were common stretching from Kentucky, Tennessee, Arkansas, Louisiana, Mississippi and Alabama. Sadly, flash flooding across parts of Kentucky swept away four children; three of them were found early this morning and the fourth is still missing. An Amish family's horse and buggy were overturned as the family was trying to cross a flooded stream. The mother and two of her six children were able to escape, but the other four were swept away. You can read the full story here. It's never fun to admit when you might be off a little, but the snow that fell last night was on the very low end of what the initial forecasts called for. Just as Ty Shesky mentioned yesterday evening, there was a lot of dry air in place about 3200ft above which ate away at the snow as it fell through that layer. The first image on the left is the forecast sounding from the NWS in Davenport, IA from last night. Notice how the dew point line (line on the left) goes almost to -30°C (-22°F). That's a lot of dry air! As the snow fell through that layer above it simply evaporated and wasn't able to reach the ground. By the time the layer was able to saturate overnight, the bulk of the snow had already moved through. This left about a couple tenths of an inch of snow across the Rockford area to maybe a couple inches further south. We'll see some sunshine this morning but the clouds will quickly begin to roll back with an upper level disturbance that is currently in the Plains. This could bring a few flurries/light snow with it later this afternoon and evening. 9:30pm Update: The NWS office in Chicago has cancelled the Winter Weather Advisory for all Stateline counties. The NWS out of the Quad Cities is continuing this advisory for Whiteside county. The dry air that I talked about earlier in this same post is indeed limiting snow totals. Although some places south of I-88 could still see 4" or more of snow, most of us are now looking at 1-3" of accumulation. Snow is showing up on the radar as of 5:36pm across the Stateline, but not at the surface just yet. There is a lot of dry air at ground level that's causing much of this snow to evaporate before it reaches the ground. Eventually the snow will reach the surface here (mainly after 8pm), but I am dropping the totals just a bit because of this dry air factor. Also, in looking at what's happening to our west, there is a sharp cut-off with the snow on the northern side of this storm. Right now it is snowing heavily at Kirksville, MO, but only lightly in Des Moines, IA with 3-mile visibility. Just 30 miles north of Des Moines in Ames, no snow is being reported at all at this time. One thing I'm speculating is that this "cut-off line" could hang-out somewhere over the Stateline, giving areas north of Rockford an inch or less of accumulation while areas to the south of I-88 still see up to 8" of snow. We'll continue to watch this... In the meantime, our latest snowfall forecast can be viewed above. 1:00pm Update: Going forecast still looks on track. The low this morning was just a little deeper and slightly further to the northwest than last night's model runs. This may push a few totals across the area closer to the 6" mark, especially to the south of I-88. We'll continue to monitor the trends of the snow as it's moving through Iowa. As of right now the only snow showing up at the surface is across northern Missouri, per the surface observations. Winter Weather Advisories still continue for Winnebago, Ogle, Lee, DeKalb, Boone, McHenry, Carroll and Whiteside counties from 6pm tonight through Friday morning. February 2011 has made the top ten list for monthly snowfall totals, as we currently sit in sixth place. February 1994 comes in at the top with an amazing 30.2"! Also on the list, 2008 and 2010. We will likely add on to our current total with tonight's snowfall along with the snow expected this weekend. Winter Weather Advisories have been issued for almost all of the WTVO forecast area, excluding our far northwest and southern Wisconsin counties. Winter Storm Warnings lie just south of the I-80 corridor where higher snow totals along with a mix of precipitation could be possible. Most of the day will remain cloudy, but dry. Temperatures will stay in the mid 30s throughout the afternoon with a few light snow showers possibly developing after 6pm. Totals could range anywhere between 3"-6" across portions of north-central and northeast Illinois with higher totals closer to the counties under the winter storm warning. We'll continue to track the storm system as it moves northeast from the southern Plains. Periods of moderate snowfall could be possible during the overnight, especially for locations further south of the Stateline. It's been more than three decades since snow has fallen in downtown San Francisco, and there is a possibility that this long streak will be broken by the end of this week. Lower elevations around Los Angeles, as well as other parts of California and the Southwest where it rarely snows, could also have snowflakes flying this weekend. Las Vegas is another place where snowflakes may be seen. In some places, the snow will be heavy enough to disrupt travel significantly or even shut down travel completely. "With snow potentially falling down to sea level in the San Francisco Bay area, this could be a one-in-30-year event if it all transpires," warned AccuWeather.com Western Expert Ken Clark Wednesday. Snow already made an appearance in some of the higher elevations around San Francisco with a storm this past weekend, and a storm moving in later this week will bring snow to even lower elevations. This is the same storm bringing significant snowfall to Seattle and Portland. The cold air coming in with this storm has Clark very impressed. "There indeed could be snow in the San Francisco Bay area and the Central Valley of California Friday afternoon and night," Clark stated, "and a few rain and snow showers Saturday. Snow levels could go down to 1,000 feet in the L.A. Basin Saturday." In downtown San Francisco, he adds that it is very possible that in a heavy rain shower there could at least be wet snowflakes. It's not a guarantee but it's certainly possible. There is growing concern that major passes around the San Francisco Bay area will be affected by snow. In addition to the San Francisco Bay area and some valleys of Southern California, snow could also fall in the Upper Deserts and the heavily-traveled passes of Southern California, including the Grapevine and Cajon Pass. "Precipitation will be all snow above 3,000 feet, or certainly below pass level," Clark said, "so the Grapevine could pick up 6 to 10 inches of snow." Clark adds that other passes, such as the 14 Freeway from L.A. to the Antelope Valley, will also be affected. He says that even the Antelope Valley itself could have snow. Snow along Interstate 40 into Arizona could become a major problem as well. 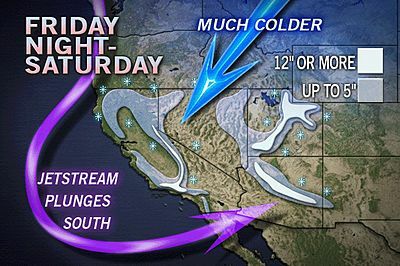 AccuWeather.com Senior Meteorologist Kristina Pydynowski has more details on the feet of snow in store for the Sierra. The last time it snowed in downtown San Francisco was on Feb. 5, 1976, when 1 inch of snow was measured. 12:30pm Update: The latest morning runs are in and have shifted the low a little further to the north Thursday night. So I'm going to keep the snow chance going with some accumulation by Friday morning. 9:30am: A weak front will pass through later this afternoon and evening and could bring a little drizzle along with it during the afternoon but also the chance for freezing drizzle/wintry mix towards evening. Once this passes to the east late Thursday the next system will slide to the south of us Thursday night into Friday. A strong low currently off the western coast of Baja California will get caught up in the southern jetstream later this afternoon and evening and move into the southern Plains Thursday. The past couple of days the general agreement on the track has been for the low to pass through Oklahoma and into southern Illinois by Thursday night before tracking into the Ohio River Valley Friday morning. With this, the track would remain too far to the south to bring us any significant accumulating snowfall, however, I'm not going to remove the snow chances just yet. Now that this system is just beginning to move onshore we're going to have a better sample of it with our upper air data. (Remember, there is a lack of weather data over the oceans) I do think that there could be a little further northward track with the low and that's why I'm hanging on to the snow possibility. Something else we'll watch for is the chance for severe weather Thursday afternoon/evening through Arkansas, Kentucky, Tennessee, Mississippi and Alabama. The Storm Prediction Center has even highlighted some of those areas with a moderate risk! The surface low will deepen as the upper level low moves through increasing moisture return ahead of it. Thunderstorms will likely be ongoing across parts of Texas and likely intensify as they move east with the low and warm front during the afternoon and evening. Tornadoes, possibly strong ones, and damaging winds will be possible with some of the more intense storms. It's not exactly unheard of, but not all that common either. Seattle, WA averages 7.1" of snow in an average winter. Compare that to the 35 to 40" that falls in an average winter for most of the Stateline, and you see what I mean. An Arctic cold front will move into the Pacific northwest Wednesday into Wednesday night. This will lower snow levels to near sea-level in the Seattle area. An upper-level low strengthening over the region will provide the instability for precipitation, which will fall as snow in most areas. Up to 6" may fall in some areas at or just a touch above sea-level. The warmer temperatures were nice while they lasted but it looks like the end of the month could be a bit chilly and a little wet. Looking at the extended for the last week of February and first week of March paint somewhat of a chilly picture. A broad trough in the west will keep the cooler air filtering in across much of the U.S. while the active storm track takes the next couple of systems either through or just to the south of the Midwest. The southern jetstream will remain fairly active and keep storm systems moving through the southern tier of the country. The phasing, or coming together, of the southern and northern branches of the jetstream will help determine just how far north these storms will track. The next big system that could have an impact on us looks to move through Thursday night. As of right now the majority of our models take this low through southern Illinois; too far south to bring us any major snowfall. There is one however, the NAM, that tracks the low further north with quickly accumulating snow by Friday morning. While nothing's set in stone it's something we'll continue to track the next couple of days. 6:00am Weather watcher in Kingston, IL: 1.0" to 1.25"
The light snow will continue to diminish as it moves east this morning. Most saw about a half an inch to inch and a half across the immediate Stateline with totals closer to two inches north in Wisconsin. Skies will remain partly to mostly cloudy with temperatures only in the low 30s. Although it's not showing-up on radar, freezing drizzle is falling across parts of the Stateline at this hour. The resulting "black ice" has caused some accidents this afternoon in portions of Stephenson county. We're still looking at a change-over to light snow later this evening, so roads (especially secondary and tertiary ones) will remain slick through morning. Please drive with caution! Noon Update: Winter Weather Advisory in effect until 4am Tuesday for Winnebago and Boone counties. This is in anticipation of the snow coming later this afternoon. Periods of heavy snow will be possible during the evening commute. Still looking at around 1"-3", with locally higher amounts possible. The freezing drizzle has pretty much ended, although there could still be a few slick spots through the remainder of the day. As we go forward this afternoon our attention will then turn to the chance for snow. A trough extending northwest from an area of low pressure in southeastern Illinois will move through during the afternoon along with an upper level disturbance. This will likely provide enough lift in the atmosphere for snow to fall during the evening commute. Totals across the region should range from 1"-3" with higher amounts possible to the north and east. We'll continue to watch trends throughout the day and should we need to update we will do so right here. Temperatures this morning are right around the freezing mark which is causing slick spots on area roadways, parking lots, sidewalks and driveways. Freezing drizzle will continue through the morning hours before changing over to all snow later this afternoon. Make sure you give yourself extra time and drive carefully as there will likely be a thin glaze of ice on surfaces. There are a few schools in southern Wisconsin that are running late. For a complete list, click here. Winter Weather Advisory continues for Winnebago, Boone and McHenry counties until noon today and for Rock, Green and Walworth counties through Tuesday morning. Area of low pressure pretty much sits in southwestern Iowa with a warm front extending eastward from it. Temperatures across southern Wisconsin and northern Illinois have risen to at least the mid-30s this morning changing over the sleet/freezing rain mix to just a very chilly rain. The Winter Storm Warnings and Winter Weather Advisories that were issued have been cancelled for the entire WTVO forecast area. The rain will continue through the afternoon as the low moves east. There were even reports of thunderstorms near Waterloo, IA. We may hear a rumble or two later today. Rainfall totals so far were nearing a quarter of an inch or higher and with additional rain expected, localized flooding may become a concern. Current radar and surface observations were indicating a mix of rain/sleet/freezing rain and even snow spreading northward across northern Illinois and southern Wisconsin. Temperatures around the area are right at or just above freezing and have been rising this morning and the precip should eventually change over to all rain by later this morning. With the near freezing temperature at the surface there could be some slick spots on sidewalks, driveways and untreated roads. There could be also be minor ice accumulation further north along the Illinois/Wisconsin border where temperatures will stay close to freezing for a longer period of time. A WINTER STORM WARNING has been issued for the Greater Rockford area from 3 am Sunday morning until 3 pm Sunday afternoon. A developing storm system will cause snow to develop across the Stateline late tonight (around 3 am), and mix with freezing rain before daybreak. Freezing rain will continue on Sunday morning. The freezing rain and sleet are expected to gradually change over to rain by late morning. In the afternoon there could even be a couple of thundersstorms as an area of good lift moves across the Stateline just ahead of the surface low as it approaches the area from the southwest. The precipitation will change over to wet snow early Sunday night as colder air swings into the area behind the departing low off to the east. Another 1" to 2" of new snow may fall on Sunday night with light snow lingering on Monday. High pressure will take control on Tuesday, and it will be mostly sunny and cold with a high in the upper 20's. As an area of low pressure begins to move closer to the region tonight, warmer air aloft will run over cooler air at the surface. This will cause a mix of snow and sleet later tonight with accumulations likely. As the warmer air continues to move in freezing rain will be likely by early Sunday morning with accumulations possibly reaching a tenth to a quarter of inch. Further north into Wisconsin periods of heavy snow/sleet will be possible as temperatures will likely remain cooler; accumulations could range between 3"-6" with locally higher amounts. As of now temperatures are expected to rise Sunday afternoon above freezing which should change the freezing rain over to just rain. However, if temperatures do not warm the freezing rain will continue with significant ice accumulations possible. As the low pressure system continues to move through northern Illinois Sunday night a change over back to snow/sleet/freezing rain will be possible with additional accululations by Monday morning. Travel Sunday may become difficult, if not dangerous, and conditions will be monitored very closely this evening and overnight. An area of low pressure will begin to strengthen over the Plains later this evening and move across northern Illinois Sunday. As it does a warm front will lift northward and be the focus for precipitation, could be heavy, to develop starting late tonight. Initial indications are suggesting the precipitation will start off as snow and sleet, with some accumulations expected. Through the overnight and early Sunday morning warmer air is expected move into the upper levels of the atmosphere which would likely change the snow and sleet to freezing rain sometime Sunday morning and then possibly just rain during the afternoon. The top image on the left is the GFS model at 6am Sunday morning. Notice the darker blues over southern Wisconsin and northern Illinois. This is indicating a heavy amount of precipiation over that area by Sunday morning. If surface temperatures were to stay right around freezing the chances of the freezing rain to switch over to rain would be less and we could be talking about a significant amount of ice accumulation Sunday. Further north into Wisconsin heavy snow is expected as temperatures will likely stay cold enough. The low will then move pretty much right over northern Illinois Sunday with a change over back to snow/sleet Sunday night. This image shows the probability of seeing at least a tenth of an inch ice accumulation Sunday through Monday. All of the forecast area is under the 10% chance with portions of north-central/northeast Illinois and southeast Wisconsin under a 40% chance. We'll continue to track this system as it moves closer through the afternoon and evening. Sunday travel may become tricky, or even dangerous, if freezing rain continues throughout the day. A Flood Advisory has been issued for the Pecatonica River near Shirland in Winnebago County until late Tuesday evening. Current stage as of mid-morning Friday was at 8.4 feet with action stage at 11 feet. Flood stage is 12 feet and the river is forecast to rise to at least 11 feet by Sunday afternoon. Ice jams that have formed from the warm up the past couple of days will likely continue with the mild weather. There is also a chance for rain this weekend which could cause local rivers to rise. Looking ahead into this weekend the first two graphics are from the Hydrometeorological Prediction Center highlighting the probabilities of seeing at least four inches of snow (top graphic) and the probability of seeing freezing rain (second graphic). The third is a composite that shows we could be in for some flooding, with the ice jams and potential rainfall, the 20th and 21st. Update: Winter Storm Watches have been issued not too far from us across parts of southwestern and western Wisconsin through Minnesota and into the Plains. Any deviation with the system to the south would mean more snow accumulation for us. We'll continue to track this through Saturday. It sure is nice to see full sunshine today rather than the clouds and fog we've were dealing with the past couple of days. Soak up the sun while you can this afternoon because the forecast this weekend looks like it may be headed downhill. A persistent trough in the west and ridge across the center of the nation will yield an active weather pattern for us this upcoming week and potentially into the following week. There are a couple systems we'll be watching going forward this weekend. The first one will come in during the afternoon Saturday. Clouds will be on the increase as high pressure departs us to the north. An area of low pressure will move northeast through the Plains and into the Great Lakes by Saturday night. As it does a warm front will likely provide enough lift to allow precipitation to begin falling late Saturday evening. The big question is in what form will it fall. Temperatures at the surface are forecast to be right around or slightly below 32° which would mean we could see a period of freezing rain during the overnight into Sunday morning with the possibility of minor ice accumulation. If temperatures stay above 32°, the precipitation that would fall would likely stay in the liquid form. If that were the case, we could have some flooding on our hands as QPF values are spitting out around an inch of precipitation. Sunday it looks like the low will move through the Wisconsin/Illinois border which could keep the freezing rain and snow threat going through the afternoon. If the low were to track a little further northwest and then north the warm front would have a better chance lifting northward which would change the freezing rain to all rain. The placement of the warm front will be very important as I think there will be a fine line of where we see snow, freezing rain and just plain rain from southern Wisconsin and into northern Illinois. The National Weather Service office in the Quad Cities has issued a special weather statement for fog tonight for Stephenson county, along with Jo Daviess, Carroll, and Whiteside. Although no such statement has been issued for Rockford thus far, there are areas of dense fog across much of the Stateline area. Cooler, drier air upon strong westerly winds will mix-out this fog after midnight or so. In the meantime, travel with caution out there! 719 PM CST THU FEB 17 2011...PATCHY DENSE FOG EARLY THIS EVENING...PATCHY DENSE FOG HAS FORMED EAST OF A LINE FROM EAST OF MANCHESTER IOWA THROUGH STERLING ILLINOIS. AS OF 7 PM THE VISIBILITIES AT THE DUBUQUE AND MONTICELLO AIRPORTS WERE AROUND ONE QUARTER OF A MILE AND SAVANNAH ILLINOIS WAS REPORTING VISIBILITIES OF A HALF MILE. GUSTY WEST WINDS BEHIND A COLD FRONT MOVING THROUGH THE AREA WILL CAUSE THE FOG TO DISSIPATE. CONDITIONS WILL IMPROVE FROM WEST TO EAST BY 10 PM. IF YOU WILL BE OUT DRIVING EARLY THIS EVENING BE PREPARED FOR LOW VISIBILITIES. BECAUSE OF THE PATCHY NATURE OF THE DENSE FOG... VISIBILITIES COULD DROP RAPIDLY WITHIN A SHORT DISTANCE. This past week has been fairly quiet in the weather department but it looks like that might be changing going into next week as the jet stream will set up right across the Midwest. This would keep the storm track through the western Great Lakes with our first system impacting us as early as Sunday. While the majority of our computer models agree that there will be storm system early next week, there is still just a little disagreement as to the track it's going to take. I guess you could use the phrase: "The devil is in the details" at this point. The GFS and GEM (Canadian model) develop a surface low pressure system late on Saturday and move it northwest of the Stateline Sunday. This would keep us on the warm side and likely produce a good amount of rain Sunday and Monday. The ECMWF (European model) develops that same low, but shifts it further south - mainly because it develops a stronger area of high pressure to our north while the other two are not as strong with the high. If that were the case we could see either a mix of precipitation or snow during that time. As of now I'm leaning more towards the warmer with a chance of mixed precipitation forecast. I feel that we might not get the colder air down far enough to push the low to the south because this weekend's temperatures aren't expected to dip much below the mid 30s. Either way, the Climate Prediction Center does have much of the U.S. in above average precipitation next week and beyond. Of course we'll continue to track this system, as it has a long way to go. Update: Dense Fog Advisory for Jo Daviess, Stephenson and Carroll counties until 1pm. A Dense Fog Advisory has been issued for Green County in Southern Wisconsin until 1pm this afternoon. Visibility in many locations has dropped down to less than a quarter of a mile across parts of southern Wisconsin as well as here in Illinois. Skies partially cleared overnight and with moisture return and recent snow melt, locally dense fog has developed. The fog will likely continue through this afternoon, overnight and into Thursday. Temperatures this morning really didn't stray too far from where we were yesterday afternoon. We made it into the upper 30s and that's where we started the day at this morning. Highs this afternoon will reach the middle 40s, but it's the highs tomorrow that have everyone talking. Record breaking warmth was felt across parts of the Plains Wednesday afternoon and we could be in that territory Thursday. A warm front will lift north through the evening which will keep the southerly winds with us, but likely cause our temperatures to rise by daybreak Thursday. This will set the stage for highs in the afternoon to reach the mid-50s - the record is 59° set back in 1981. Even though we will likely see fog, clouds and a few rain showers we should have enough of a southerly push to help us reach the 50s. Snow piled up by the foot, the heaviest fall of it in more than a century, has wreaked havoc along the east coast of South Korea. Reports tell of hundreds of house collapses. Government deployment of 12,000 soldiers has been undertaken to rescue stranded motorists, said to number in the hundreds. The deep falls of snow were triggered late last week by cold, wet winds off the Sea of Japan piling against the mountain spine of eastern Korea. Little or none of this snow reached Seoul and western South Korea. The province of Gangwon was hardest hit, as in one city there was a 2.6-foot fall of snow within 24 hours. This was reportedly the highest snowfall in 100 years of weather records. 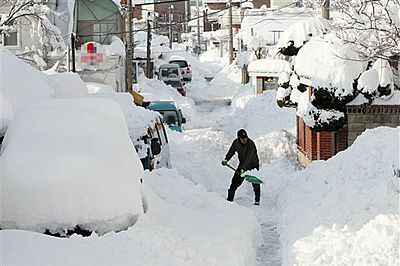 According to meteorological data available to AccuWeather.com meteorologists, snowfall was about 40 inches (more than one meter) within two days at Donhae, Gangwon. This snowfall had water equivalent to 4 inches of rain, or about two-thirds more than what normally falls throughout February. At the start of this week, another storm dumped up to another foot of snow on the hard-hit areas. Well, Mount St. Helens shared its love this Valentine's Day with quite a remarkable shake. An earthquake of 4.3 magnitude hit Mount St. Helens this morning at 10:35 a.m. After its initial shock of 3.3, it was later upgraded to a 4.3. Several minutes later, another earthquake of magnitude 2.8 struck the same area. Over a dozen aftershocks were felt after these two earthquakes. The 4.3 earthquake will allow scientists to measure any changes in the ground. These changes will indicate whether or not there is pressure from possible rising magma. More about this story can be found here. Anyone else have a touch of spring fever after this past weekend? I know I sure did! Typically during the month of January we experience some type of 'winter thaw' but high temperatures during that month struggled to make it much past 36°. After such a chilly start to February it looks like spring will be making an early apperance, at least in the short-term. Temperatures Saturday made it to 38° and Sunday we topped off at 44°. While we might sit just a few degrees cooler this afternoon, the warming trend will continue through the end of this week with high temperatures on Thursday possibly reaching into the low to even mid 50s during the afternoon! The jetstream, which has been positioned across the south this winter, will finally move northward and this will allow very mild air to spill up into the Plains and much of the Midwest. Each day the current snow pack will continue to melt away with the only evidence of the February blizzard being the larger snow piles that typically take a couple warm spells to completely melt away. 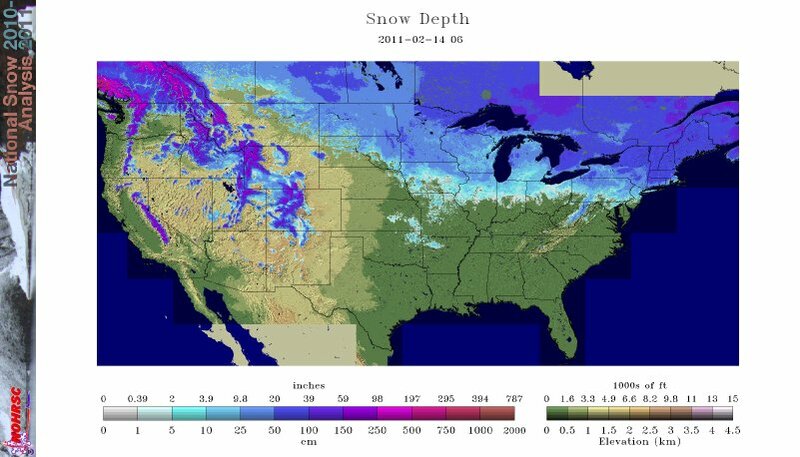 This is the current snow depth across the U.S. and you can see how the recent snow across the southern Plains and south has pretty much melted away. This should only help us in reaching the 40s and 50s by the end of this week. The National Operational Hydrologic Remote Sensing Center has pretty cool animations of the past two weeks in regards to snow depth, snow melt, average snowpack temperature and so forth. To view these animations, just click on the link above and click "Two Weeks". A big Thank You to Irene Meeker for sending in this photo taken from the Morgan Street bridge Sunday morning where a dozen eagles sat. She says "Shortly after this was taken the wind came up and 11 of the eagles started soaring high above the Rock River". She also said that there were a couple eagles visiting the Kishwaukee River near the Kishwaukee Forest Preserve. Thanks you again Irene for you photo! Pretty cool! A vigorous Clipper System up along the Canadian border over NE Minnesota has tightened our pressure gradiant, and is responsible to our brisk southwesterly winds, and the nice warm up experienced by the Stateline on Sunday. The temperature on topped out at 44 degrees, and that was the warmest we have seen since December 31st when 53 degrees was reported at the Rockford airport. A Pacific type of cold front will pass through the Stateline tonight, and the winds will switch to the northwest making for cooler weather on Valentines Day. It will continue to be windy overnight with southwesterly winds from 15 to 30 mph gusting to 35 mph, and switching to the northwest before daybreak. It will still be windy in the morning on Valentine's Day, but the wind will diminish in the afternoon as skies become mostly sunny. The high temperature on Monday will be around 37 degrees. Monday night could be the coolest night of the week as high pressure settles into the area with clear skies, light winds, and good radiational cooling. There could also be some ground fog that develops after midnight from moisture left over from the melting snow during Sunday and Monday. On Tuesday high pressure will shift off to the east allowing southerly winds to develop again beginning another warm up the will push temperatures into the low 40's on Wednesday, and the low 50's on Thursday. The Gulf of Mexico is expected to provide enough moisture on Thursday to cause some rain showers as a weather system approaches from the southwest. On Friday an intensifying storm system over Lake Superior will push a cold front across northern Illinois bringing an end to the mild weather for the time being. The high temperature on Saturday is not expected to push above 30 degrees. A developing weather system over the southern plains needs to be watched next Sunday and Monday. It could bring snow back to the Stateline. The warming trend will continue on Sunday as a vigorous Alberta Clipper moves eastward across southern Canada to our north. The wind will be brisk by Sunday afternoon out of the southwest. A cold front will push through the Stateline on Sunday night switching winds to the west. A brief cool down will take place early in the week, but it will not last long with warmer air moving back into the area Tuesday. There may be some freezing drizzle of light freezing rain on Tuesday night. Then, there could be some light rain, drizzle and fog off and on through Friday. It will get progressively warmer during the rest of the work week with a 50 degree high temperature possible by Friday. On Saturday it will turn colder with a high back down in the middle 30's. 2:00 pm: Trying to measure snowfall, especially in a situation like we had last week with the significant amount of wind and the little snow that fell ahead of the main event, is probably one of the most difficult tasks for a meteorologist or weather observer. There was much talk among the meteorologists at the Chicago National Weather Service this past week as to how exactly this storm was to be measured. The storm system itself was very complex as there were many different components to it during the 2 day event. Initially there was a lead shortwave out ahead of the storm that produced a little snow during the very early morning hours of the 1st followed by lake effect snow that made it as far west as Rockford later that morning; see post from the morning of the 1st. These totals were included, at first, with the overall snow totals giving us our 14.3"; 10.9" on the 1st and 3.4" on the 2nd. However, the meteorologists with the NWS felt that because the lead shortwave and lake effect were not the 'main system" those totals should not have been included. This was determined after taking a detailed look at numerous surface observations, radar data and synoptic weather patterns which some argued showed a brief break where no snow was falling. They felt that the correct storm total for the blizzard should have been 14.0", taking away three tenths of an inch that had fallen prior. During the conference call with the NWS, fellow meteorologists in Rockford, Chicago and several weather observers, there was much debate as to why we would now, a week later, decide to make these changes. The official data that is sent to the NCDC (National Climatic Data Center) is based upon calendar days and not on co-op times; 7am through 7am the following day. Everything that the NWS office keeps is considered unofficial or preliminary. The purpose of making these changes not only to totals here in Rockford but also for Chicago and the Romeoville office, was pretty much for their own record keeping. They feel the purpose of the numbers can be used as a comparison and perspective to future storms. The argument that came up during the call was that when we forecast, we forecast for the main event and not the different parts of the storm. In my opinion, the lead wave out ahead of the main low and the lake effect snow were all connected and an actual part of the storm system; even though the bulk of the heaviest snow didn't fall until mid-afternoon/evening on Tuesday and this should be included in your storm total. As a result, the NWS will NOT be changing the total to 14.0" for the blizzard event. If anything the total may go up to include the January 31st amount. If this does happen, we will update right here! Just as Jim Allsopp (NWS) put it at the end - "There has not been a snowstorm like this with all the wind, lightning and snow". I know it's hard to think about with snow on the ground but it's that time again. Severe weather season is right around the corner and spotter training classes have already been scheduled and begin next week! Spotters are very valuable not only to the National Weather Service but to us at WTVO. You are our eyes to what is going on in your backyard and the information you relay to us and the weather service is very important. It actually looks like the February 16th class in Ogle County is out. Light snow will continue to move across northern Illinois this morning along a warm front that stretches through southern Wisconsin. Accumulations are expected to remain minor with a dusting up to an inch possible. The light snow continues to fall across the Rockford Metro with a heavier band stretching just west of Stockton southward into Mt. Carroll. This will continue to move east throughout the morning. The mercury bottomed-out at -20F at the Rockford Airport this morning. This breaks the old record low temperature for this date (Feb. 10th) of -19F set back in 1994. At left are other low temperatures across the area this morning. Coincidentally, record lows were being smashed in other parts of the country as well. In Tulsa, OK, a daily record low of -12F was recorded. And closer to the Kansas state line, Nowata, OK bottomed-out at -31F. That's a new record low for the state of Oklahoma! While we were sitting below zero this morning temperatures in Alaska were approaching the freezing mark. How could Alaska be warmer than us? Remember the old saying, "What goes up, must come down". The jetstream has remained positioned across the southern tier of the U.S for some time which has allowed the cold air in the arctic to funnel down through the heartland. Much of the west coast, even the western coast of Canada, has seen the opposite with a ridge of high pressure. This ridge will actually start to break down and progress eastward through the weekend. This will gradually begin to push the jetstream northward allowing temperatures to warm near average and possibly above into early next week. Oh My - It's COLD Outside!! Temperatures this morning have dipped well below zero with wind chill readings even colder! It almost takes your breath away when going outside! At 6am, the temperature at the Chicago/Rockford Int'l Airport dropped to -16°, making it the coldest morning we've seen so far this winter season. Dixon was down to -24°! The previous coldest temperature was -12° back on February 3rd. It's important to remember that frostbite can occur within a matter of 20-30 minutes to exposed skin, so the hat, gloves and scarf are a must this morning! * WIND CHILL VALUES...20 TO 25 BELOW ZERO. * IMPACTS...WIND CHILL VALUES AT THIS LEVEL WILL CAUSE FROSTBITE TO EXPOSED SKIN WITHIN 30 MINUTES. SIMILAR TO THEIR HUMAN CAREGIVERS. Rockford currently has 18" of snow on the ground, and snow is covering the ground from the US-Canadian border all the way down to parts of Oklahoma and Texas as of this morning. With all this snow, flooding could become a concern later this month for us and into the Spring months for areas to our north. Temperatures could reach the upper-30s here this weekend, which will melt the snow very slowly at best. But as the month goes on, the potential for warmer weather exists which could cause quicker melting and flooding concerns. This is something we'll have to watch for in coming weeks. Wind Chill Advisory continues for Stephenson, Jo Daviess, Carroll and Whiteside Counties through the Noon hour and will go in to effect for Winnebago, Boone, McHenry, Ogle, Lee, DeKalb, Rock, Green and Walworth Counties tonight. However you look at it this morning, it's cold outside! We had a few flurries early this morning but partly sunny skies will continue through the remainder of this afternoon. Despite all that sunshine highs will struggle to reach the double digits later today with wind chill readings remaining below zero. The colder weather will continue for the next couple of days before a warm up this weekend. The current snow cover on the ground will only help keep this chilly weather around as many locations have a snow depth of over a foot. So far this season we've managed to accumulate 48.5" of snow; our average is 38.7". What makes this even more interesting is if we pick up just another inch and a half of snow we will have had four winter seasons in a row with 50" or more of snowfall.